安洲, 王斐, 李笑梅, 钱帮群, 王旭, 仝飞. 安徽省芜湖市2014年狂犬病暴露处置监测分析[J]. 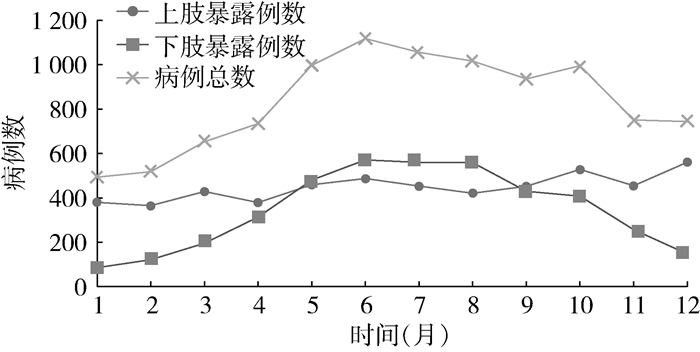 中国媒介生物学及控制杂志, 2018, 29(6): 641-644. AN Zhou, WANG Fei, LI Xiao-mei, QIAN Bang-qun, WANG Xu, TONG Fei. Analysis of rabies post-exposure treatment surveillance in Wuhu city in 2014[J]. Chin J Vector Biol & Control, 2018, 29(6): 641-644. Abstract: Objective To study the situation of rabies post-exposure treatment surveillance in Wuhu city in 2014 and provide evidence for rabies prevention and control. 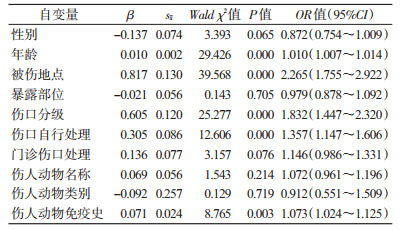 Methods The data of rabies post-exposure treatment surveillance were collected from dog-bite injury clinic of Wuhu Center for Disease Control and Prevention in 2014, descriptive epidemiological analysis and Logistic regression were applied for data analysis. Results A total of 10 009 cases of rabies post-exposure treatment were reported, the majority of these cases were young-and middle-aged adults; cases were reported every month, exposure mainly occurred in summer and autumn, the number from May to October accounted for 60.99% of all incidents. Injuries were mostly on four limbs and GradeⅡ exposure, and the upper and lower limbs accounted for 53.64% and 41.27% respectively, grade Ⅱ and gradeⅢexposures accounted for 86.38% and 12.30% respectively, all exposed cases were inoculated with rabies vaccines and 38.42% of cases with Grade Ⅲ exposure were given passive immunizing agents. However, 8.71% of the wounds were untreated after exposure, dog bites constituted 78.31% of all exposures and only 22.59% of dogs were vaccinated before and without vaccination accounted for 72.36%. Age, injured place, grade of exposure, wound self-treatment and immunization history of the animals were the protective factors. 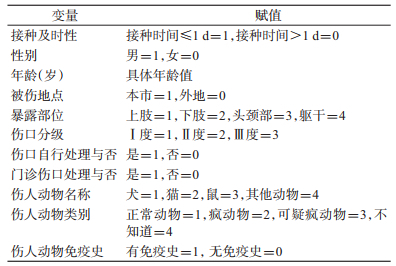 Conclusion Injuries were mostly Grade Ⅱ exposure in Wuhu during 2014, low rates of passive immunizing agents among the cases with Grade Ⅲ exposure, parts of the cases lack of standard wound treatment after exposure. Therefore, public health education and post-exposure treatment should be further strengthened to reduce the risk of rabies incidence. 刘莉红, 陆大钧, 陈俊杰. 宜春市2012年狂犬病暴露人群监测分析[J]. 现代预防医学, 2014, 41(8): 1517-1519.